Sam and Andi try to find Tony to help them translate the scroll Nina brought back from Hell. Sam discovers that he can summon The Devil with a specific incantation that will trap him into a competition. Sam challenges The Devil to a game of quarters, but they play to a draw and The Devil refuses a rematch, so Andi offers her soul as collateral. The Devil places Sam in a corporation that is actually a front for corrupting people into sinning so the Devil can collect their souls. Sam receives a text message from his Dad in Hell, revealing that he has important information about how Sam can get out of his deal. After discovering the company's offices contain a portal to Hell, the guys and Andi convince Nina to use the portal to go back to Hell to retrieve the information. Sam is excited to learn the next soul he has to capture is his old high school biology teacher, Mr. Sprong, whom everyone hated. He and Andi eagerly search for Mr. Sprong to send him back to Hell, but the teacher reports the two to the police. Meanwhile, Ben realizes he must fight for his love after Nina goes into heat, emitting a pheromone that has demons from all over the world coming to hit on her. Sam convinces Alan to tell him how Alan won his soul back from the Devil. In exchange, Sam must figure out how to relocate Alan to the Vatican, where the consecrated ground will keep him safe. Meanwhile, the Devil pits Sam and Morgan against each other, and Nina demands that Ben introduce her to his family. The Devil introduces Sam to Morgan, his charming, rich, perfect other son. The Devil tells Sam he must teach Morgan how to have a stronger work ethic as he's grooming him to take over the "family business" so Sam reluctantly takes Morgan with him to capture the next escaped soul. Meanwhile, Sock uses Ted in his next Work Bench scheme and Ben thinks Nina is secretly disgusted by his human form. Ben would like to introduce Nina to Sam and Sock but he's concerned they won't accept her because she's a demon. Andi discovers Sock has created a fake employee at the Work Bench to double his salary, but when he refuses to fix the situation the two go head-to-head in a battle of wits. Meanwhile, The Devil tells Sam he must send a prizefighter from the fifties back to Hell by getting in the ring with him and knocking him out. Sam's been given a new assignment from the Devil but all he can focus on is finding out how Alan got of his deal with the Devil. However, after Sam and Alan are attacked by two demons sent by the Devil, Alan refuses to talk to him anymore and disappears. One of the demons takes a surprising interest in Ben. Sam deals with a soul who is immune to his vessel... and steals it from Sam. Meanwhile, the guys discover they've been evicted from their apartment, and Andi refuses to resolve things with Sam. The demons still have plans for Sam as they plot to overthrow the Devil. Meanwhile, Sock becomes romantically involved with a demon. When one of Sam's captured souls returns to Earth, the Devil suspects a conspiracy to free his prisoners, and forces Sam to find out who's responsible. Sam and Andi are attacked by a chainsaw wielding masked killer, and things only get worse when Andi's ex-boyfriend Greg appears, asks her to dump Sam, and she does so. Suspecting an evil soul at work, Sam finds the Devil less then helpful and must go to Gladys for assistance. Meanwhile, Ben deals with his overly-possessive green card wife. Andi finally learns that Sam is a Reaper. Meanwhile, Ben finds the new love of his life. Sam is recruited by demons that want to use him to lure the Devil into a trap. Meanwhile, Sam and the guys must deal with a damned soul of a lawyer who uses leeches on his victims. An escaped soul with an acid touch goes after Andi, giving Sam a personal stake in hunting it down. Sam, Ben, and Sock move out of their parents' homes and into an apartment complex, and befriend a gay couple. The two pairs of guys get on great, but Tony and Steve, their new friends, hide a dark secret. Meanwhile, Sam tries to deal with his suspicions about Cady while hunting for a soul that hunts human prey. Sam is secretly dating Cady, because Sock and Ben are afraid she may be the Devil's daughter. The latest escaped soul is a former bank robber who has come back to spend the cash he hid after his last heist. Sam, Sock and Ben capture the soul but discover that their mission isn't complete, and discover they can't decide what to do with the money. The Devil sends Sam to do some plumbing for Mimi, and Sam discovers that she's been unknowingly dating the Devil for 20 years. Meanwhile, Sam and the guys try to track down an escaped soul that possesses the cremated ashes of his victims to kill their relatives. Sock becomes obsessed with Gladys the DMV Demon, and drags Ben into checking her out when it appears she's hiding bodies in her basement. Meanwhile, Sam gets a reward from the Devil for solving his most recent case... and finds himself set up for a murder he didn't commit. The Devil sends Sam after a thrill-seeking pair of escaped souls, Holly and Kit, who cause fatal traffic wrecks. Worse, however, the Devil has a few dating tips for Sam as he meets a new girl. When Sam tries to return a capture soul, Leon, he discovers that demons don't work on Halloween, leaving the Devil bored and depressed. The Devil gives Sam a new assignment, to bring in a serial killer. Meanwhile, Leon wants a second chance. Sam finds he can't stop slipping and falling when he walks and realizes it is connected to the latest demon, who was the former head of a company dumping toxic waste. He also gets a copy of the contract his parents signed, but it is thousands of pages long so his dad offers to help translate it. The Devil shows Sam pictures of people who were killed by insects. Sam, Sock and Ben learn that the escaped soul kills people at a particular apartment. Meanwhile, Sam is depressed when Andi meets a guy at college who encourages her to quit working at The Work Bench and go back to school full time. Sam awakes to find that he is shocked each time he touches anything. The Devil tells him that this is happening due to the escaped soul and he must use the new vessel -- a remote control monster truck -- to capture the soul. To do so, Sam gets help from Sock and Ben to take down the angry soul. 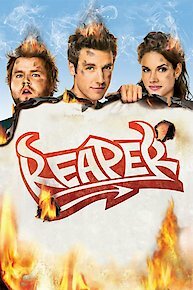 Reaper is currently available to watch free on ABC and stream on The CW. You can also stream, download, buy, rent Reaper on demand at Amazon, Vudu, Google Play, iTunes online.